When Findlay Market opened for business in 1855, Eckerlin Meats was there. Today, Bob Lillis is the fourth generation to run Eckerlin Meats. Bob's great-grandfather, Ernie Eckerlin, came from Baden, Germany. The first Eckerlin Meats was a Cincinnati slaughterhouse that Ernie opened. Ernie expanded the business to include a retail stand at Findlay Market where his daughter, Frieda, worked. She married another Eckerlin employee, Al Lillis. Their son, Bob, continued the business and then handed it down to Bob Lillis, Jr., who runs the stand today. Bob's six siblings have all been a part of the family business at one point or another while they were growing up. 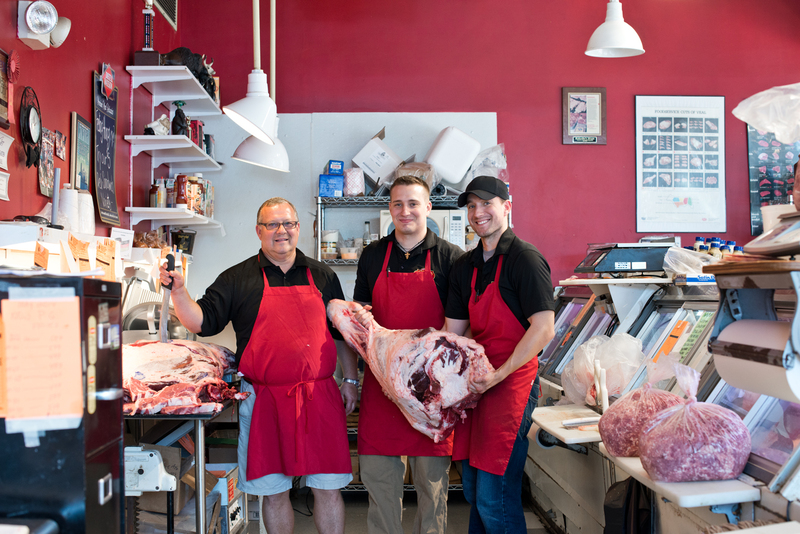 When their dad retired in 1983, it was Bob who carried Eckerlin Meats into its fourth generation. He was 23 years old, and had been behind the stand every Saturday since he was a kid. Now, the fifth generation has come to work. Bob's nephew, Ryan, is a full time employee at the stand and one or more of Bob's kids, Christopher, Dan, Josh, and Katie, can be found working Saturdays. Making sirloin patties was one of Bob's first jobs. He also remembers being quite young as he skewered "city chicken," which is actually chunks of pork or veal on a stick. Several legends explain how "city chicken" got its name. Bob grew up believing the name began with folks from the country who thought the skewered meat looked like a chicken leg. Since they encountered it only in the city, the skewered meat became "city chicken". Today Bob still offers many favorites enjoyed by his great grandfather's very first customers, including goetta. This local specialty is a mixture of pork, beef, oatmeal, onions, and spices, formed into a loaf and cooked slowly.It's been a part of Cincinnati cuisine since the first German immigrants arrived. Bob makes "Eckerlin's Best Goetta" himself every day, from a family recipe over one hundred years old. On the label is a turn-of-the-century photograph of his Grandmother Frieda's brother, Adolph Eckerlin, in his Mt. Adams butcher shop. Adolph is dapper in a dress shirt (sleeves rolled up, of course) and necktie underneath his butcher's apron. The sign behind the counter reads "The best goetta in town." It's the best in the world, according to many customers today. Bob ships it all over the U.S. He has customers from Germany and, when they're in Cincinnati, they buy Eckerlin's goetta to take back home. In town, it's been voted "Best Goetta" twice by Cincinnati Magazine. Every week, Eckerlin's sells 300 to 500 pounds of it, as lots of local customers continue to cast their votes with their wallets. 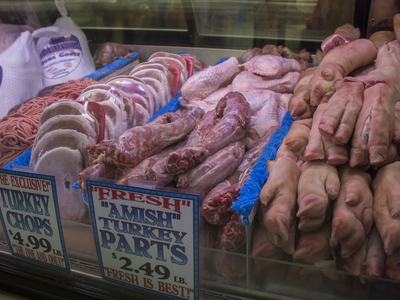 The stand is also well-known for fresh cuts of beef, select pork, and chicken. Other homemade fare includes sausages, braciole, barbecue, and rouladen. Bob, his family, and his employees stuff the chicken breasts, flank steaks, and pork chops themselves. You'll also find choice cuts of low-fat bison meat raised without antibiotics or hormones. They offer several kinds of bacon, including Cajun, country pepper, hickory smoked, and low-salt. Eckerlin Meats also caters parties, with a large assortment of sandwich, vegetable, and fruit trays, and a super three-foot party sub.